Oceanside is a classic Southern California beach town located in San Diego County. It features a quirky and festive harbor village, historic wooden pier that was built in 1888 and six miles of beautiful white sandy beach. It is a fun and exciting place to visit with its relaxed and enjoyable atmosphere, well-preserved historic district and absolutely perfect weather. 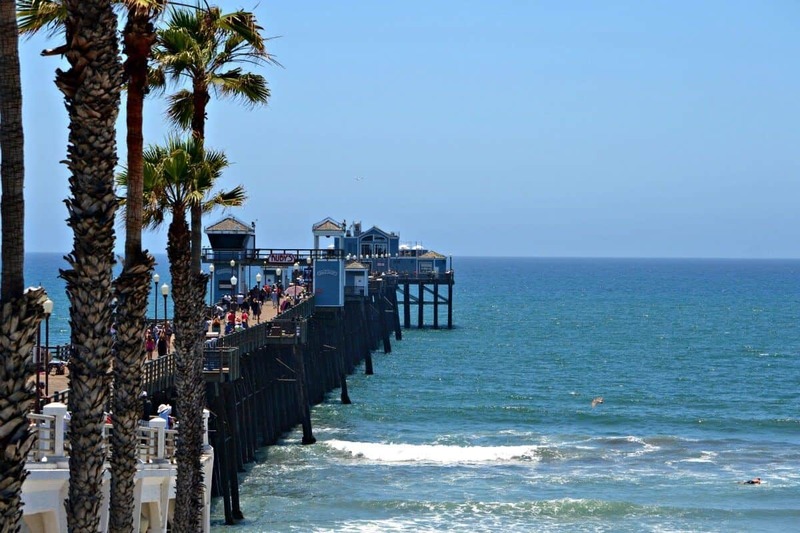 The following are some of the best things to visit and do when you are in Oceanside, CA. A large assortment of activities are offered at Oceanside Pier for those who love outdoor adventure. There is almost a quarter-mile of sand for boating enthusiasts to launch their sailboats from. There is also a marine base and large marina for other places to launch your boat from. Fishermen will also find plenty of local species of fish to catch along the 1600-foot pier. There are also picnic areas with barbecue grills for eating and relaxing in. From the shoreline or water, you can watch sea birds and go surfing. The harbor beach also has plenty of restaurants and coastal walks to keep everyone entertained. The Oceanside Museum of Art first opened in 1997 and started to provide Oceanside residents with public programs and exhibitions. More than fifteen contemporary art exhibits are provided by the museum each year along with culinary events, films, concerns in addition to fundraising events and tours. The museum is open to the general public Tuesdays through Saturdays and is one of the best places to visit in Oceanside. Harbor Beach is comprised of a quarter mile of shoreline and sand. There are sheltered picnic areas and volleyball courts on the beach, along with jetties for fisherman and a playground. The beach is shared by both tourists and locals alike, including fisherman, boating enthusiasts, surfers and body boarders. If you have children, it is a really fun place to visit that everyone in the family will absolutely love. There are plenty of facilities here, with picnic areas, beach showers, fire rings and restrooms, in addition to plenty of restaurants on the street. The costal walking trails and local fish varieties are two of the major attractions of Harbor Beach. Founded in 1986, the museum serves as a resource center for surfing in the area, along with the art and culture surrounding it as well as the lifestyle that is associated with this thrilling activity. California Surf Museum captures this lifestyle sport’s heritage, and aims to educate future generations about all of the enjoyment that surfing has to offer. This non-profit museum offers a large selection of various artifacts and hosts various exhibits for visitors to enjoy. The exhibits are on various topics including the history of surfing, information on surfboards, and pop culture surrounding surfing, surfing legends, and information on how to find your very own swell. This market is a great place for both visitors and local residents to participate in various family-friendly events all year long. There is a large selection of merchandise and food available, along with live entertainment. Oceanside Sunset Market opens in August 2007 and is still going strong ten years later. Some of the various events that take place here include a world marketplace with crafts and other merchandise, an international food court and author’s night. This mission was founded in 1798, and went on to experience five different occupation periods, ranging from the Luiseno Indians, then into the Spanish Mission and Mexican Secularization periods, American Military and restoration during the twentieth century. The mission is comprised of a Franciscan Friar ministry within the Saint Barbara province, which holds different community fundraising events over the course of the year to provide assistance to the local community. There is a museum at the the mission that features Luiseno Indian culture artifacts and remnants from the Spanish Franciscans who during its early days helped with settling the mission. There are also private retreats offered by the mission that provide a place for revitalization, healing and spiritual renewal. Guajome Regional Park offers you to spend nights sleeping underneath the stars. The park offers so many things to see and do, and is located near many historical points of interest and entertainment venues. At the park there are plenty of opportunities for bird watching, hiking, picnicking and camping. There are two ponds at the park where many different species of fish and birds live. Fisherman can relax and enjoy fishing here. The park features a variety of contrasting landscapes from grasslands and wetlands to chaparral and woodlands. Guajome Regional Park is just 8 miles away from the Pacific Ocean which makes it the ideal spot for a fun family vacation. The fascinating yet small Buena Vista Audubon Society and Nature Center is located on the northern side of Buena Vista Lagoon. There are several exhibits and displays inside of the center showcasing the San Diego area’s native wildlife and plant life. These displays have been created to recreate realistic representations of these natural habitats and there are both living plant and taxidermy exhibits. There are plenty of areas for the kids to explore and places to watch the wildlife and enjoy a picnic. There are also a couple of short trails close to the Nature Center that people of all ages and fitness levels can enjoy. There are plenty of opportunities on the trials to see many of lagoon residents. There are so many other fun and interesting things to do and visit when you are in Oceanside, California. We hope our list above will help you find some fun things to do for your entire family, and if you don’t have enough time to take everything in during one visit, you can always come back. Oceanside is a pleasant and fun place to visit all year long.